Il Mulinello is a lovely, romantic hideaway for two in an idyllic setting, perched over a river that lulls you to sleep at night and soothes you during the day. The house was completely refurbished and remodeled in 2005 and is reserved for adult, non-smoking guests. There is an enchanting garden with a paved courtyard and hidden patios among bamboo, palm trees, and hydrangeas that afford privacy and a tropical atmosphere. There are wide steps leading directly into the crystal clear waters of the river, ideal for a cooling dip on hot sunny days. From the house and garden, there are breath-taking views of the lush, verdant mountains of the Parco delle Apuane national park. Il Mulinello is one kilometer from both Equi Terme and Monzone, each of which offer a variety of shops and restaurants. Wonderful views of the mountains and the adjacent national park. The house is on a lovely river. We had a great time at Il Mulinello. It is very peaceful and yet there is lots to do in the area, especially if you enjoy hiking without throngs of people. The only reason I did not give 5 stars is the bed is quite uncomfortable and the place could use a really good cleaning to get rid of the cob webs and ants. location, location, location.....plus everything you need for a totally relaxing break in Tuscany/Liguria. The drive to La Spezia/autostrada becomes a little tiring after the first few day trips to Cinque Terre / Portofino etc. but returning to the peace and tranquility of the river makes it all worth while. Fivizzano village is also worth a visit but not mentioned in any of the guide books, a short car journey and close to home. Thanks very much for being our guest and for your kind words. We are glad you enjoyed your stay. We had a delightfull time in the north of Tuscany. For us, a couple of two, a perfect home to be away from work, cities, internet, etc. Pure nature in the hills and cool down in the forrest. The little villages and shops within 30 min, gave us our peace of mind back. Thank you very much for your kind words. We are delighted that you enjoyed the house. A house big enough for a family surrounded by the green hills of Tuscany. We spend there 4 nights. A beautiful (stone walls) spacious bedroom, a big living room, and perfectly equipped kitchen made the stay comfortable. The heating worked well enough to help us forget about not typical Italian cold weather. Unfortunately we couldn't use the terrace - the rain and cold kept us inside during the meals. The surrounding garden full of flowers and trees, a river, and singing birds let you forget about your everyday life. Some may miss the TV set but for us the only problem was the lack of torch when we arrived at night and could not see the path to the house. The stay in The Mill was a great experience. Thank you, Art! We spent 2 weeks at Il Mulinello in October 2013, and can recommend the accommodation to any vacationer. For not much more than the price of a cramped hotel room, you can spread out in a whole house in a living/dining room, a separate bedroom, a fully furnished kitchen & bonus room with washing machine. This allows you to participate in the daily life of the local residents, by shopping for fresh bread at the nearby bakery (walking distance), for produce a the farmers' market, etc. 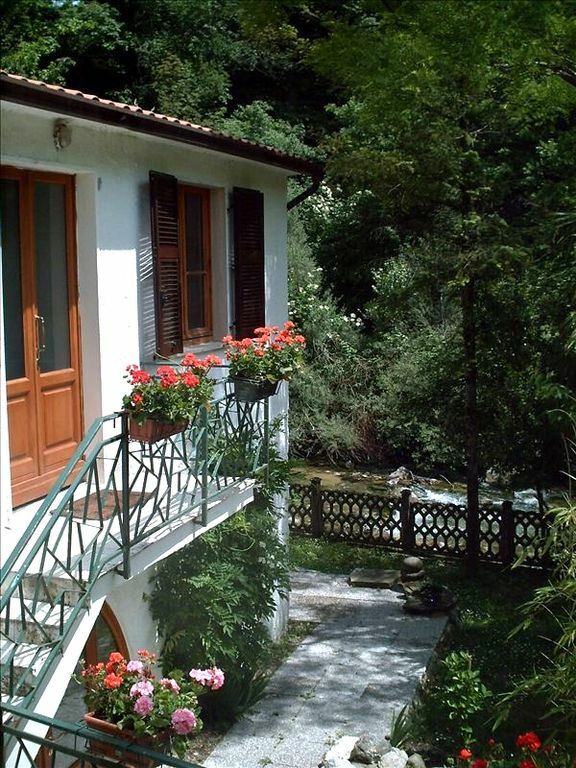 The house is situated on the bank of a lovely river and is very private. The location is convenient for day trips to many popular tourist sites, e.g., Lucca, Pisa, Lerici, Cinque Terre, and many more. After enjoying the benefits of the house, it would be difficult to go back to a hotel. My wife and I spent 4 nights in this lovely villa. As you can see from other comments this place is off the beaten path and takes you back in time in a very good way. You feel the real Italia. Specifically Tuscany. We loved the river. It was so soothing to sleep to or swim in (which I did every day). There are a few great restaurants around in different villages that you MUST try. The bakery is around corner within few minutes of walking distance (heading towards Equi Terme). We had fresh bread every morning . Down a few kilometers in the town of Gragnola there is a great grocery store with awesome fresh fruit, a butcher, and deli with tons of cheese to choose from. We picked up few items and cooked twice in the villa. We can't say enough about the place, the area and the whole experience. Thanks to Art, the directions to the villa was perfect, no GPS for us. I must admit that it would have been very challenging if we did not have our own car. We are looking forward to coming back and this time spending a little more time there. In the villa there are two very helpful books. One from the owners with their suggestions as well as letters from previous guest. I highly recommend reading them upon your arrival, they will help a lot with getting to know the area. Thanks so much; we are delighted you enjoyed your visit.